We just got two recent polls, one from Abacus and one from Ekos. I decided to run some projections based on them. I know I should probably also be using other recent polls, but I thought it'd be interesting to only use the most recent ones. The two polls actually don't agree about who is on top. Ekos has the Liberals second and dropping, while Abacus sees a small LPC lead. The difference for the Grits between the two polls is actually statistically significant (mostly because Ekos has such a large sample size with over 4000 observations). And the CPC lead over the LPC in the same Ekos poll is also significant. It's a tie according to Abacus. However, the differences are mostly driven by bigger ones at the province level. 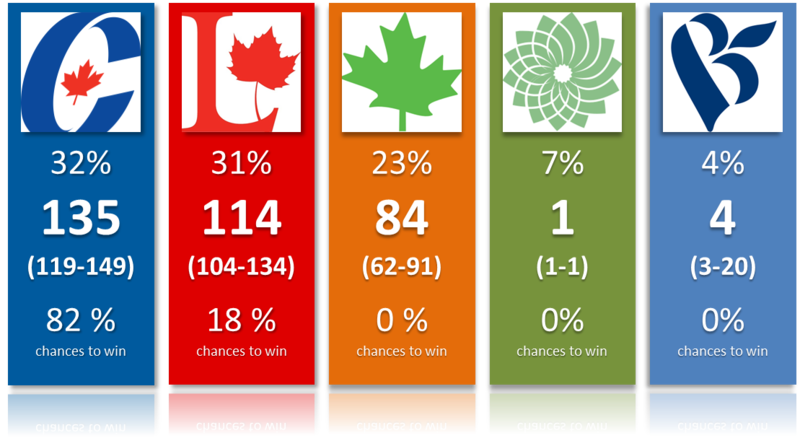 For instance, Ekos has the CPC ahead in Ontario (37% vs 32%) while Abacus gives a 2 points edge to the party of Justin Trudeau. Variations are to be expected across polls and this is why doing an average is superior, especially at the province level. The detailed projections can be found here. Otherwise you can use a slightly older version of the model with the simulator. As you can see, Stephen Harper would be favorite. This isn't new as I've had this situation for a little while. Remember that the electoral system is now favoring the Tories slightly (i.e: if the Liberals and Conservatives have the same % Canada wide, the latter would win the most seats in the most likely scenario). What is maybe surprising are that the chances of winning are so much higher for the Conservatives. More than 80% chances is relatively comfortable for Stephen Harper. Of course, the election isn't tomorrow. The NDP isn't that far behind and I actually have this party finishing second (ahead of the Liberals) about 10 times out of 5000 simulations. In other words: highly unlikely. As a matter of fact, if that were the final projections during a campaign, there would be very little uncertainty. And remember that my simulations account for much more uncertainty than the pure margins of error. The NDP is down everywhere compared to 2011, including in Quebec. However, thanks to the Bloc staying below 20% and the Liberals down as well (compared to their level after Trudeau became the Liberal leader), they'd still easily win the most seats in la Belle Province. This alone guarantees that the NDP wouldn't collapse completely or go back to its pre-2011 level (despite not being polled a lot higher than in the past!). Speaking of Quebec, the CPC is still pretty high there and thanks to an efficient concentration of its votes, they could win more seats than what people would expect. If we were to ultimately get all four parties below 30%, the electoral system could lead to some weird results. A majority is quite unlikely at this point. I only have two simulations where the Conservatives would win 169 seats or more. And zero for the Liberals. At the same, it makes sense. Imagine if a party polled in the low 30s was to get a majority, that would be pretty insane. Finally, the Green party remains very high in BC, in both polls. The model still only projects one seat in average but there are other ridings where this party has none 0% chances of winning. Also keep in mind that the current model doesn't include riding-specific effect. The same type of effects that allowed Elizabeth May to win in 2011. They might be added later. At the end, remember that these projections are based on only two polls and we are still months away from the next election. With that said, polls have been relatively stable for a couple of months (in average). Currently, Stephen Harper seems in a better position than Justin Trudeau but it could all change once the election begins.